Kendall-Jackson today unveiled the nation’s largest rooftop solar cogeneration system at our main winery. 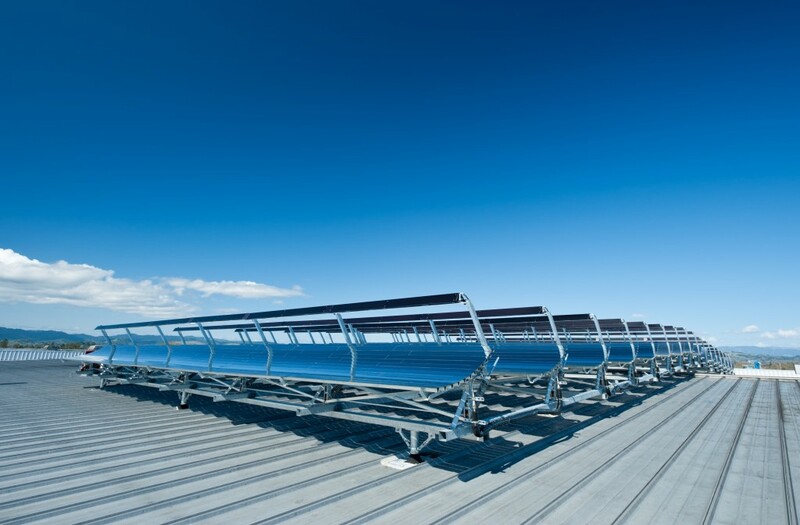 We partnered with Cogenra Solar, which developed this transformative technology and installed the 96-module hybrid array. U.S. Congressman Mike Thompson and Katie Jackson spoke to the crowd of elected officials and local business leaders at Kendall-Jackson’s Wine Center to introduce our latest sustainability project. 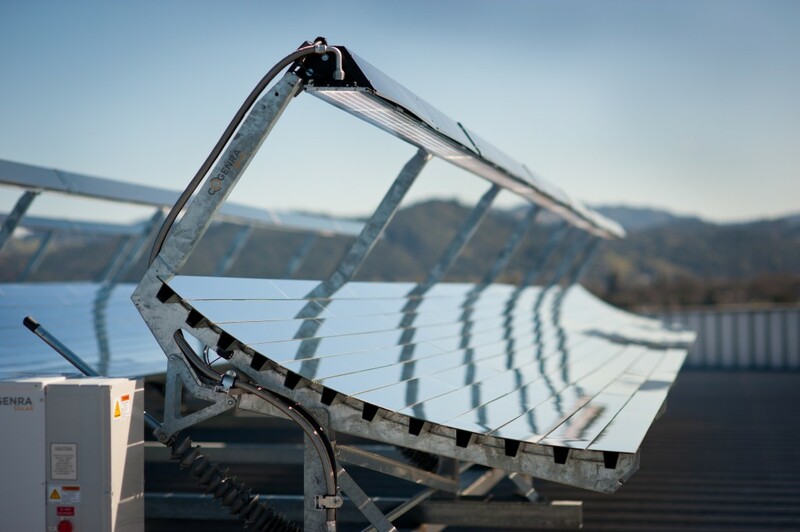 This solar cogeneration system captures the suns energy and converts it into both solar electricity and solar hot water. The system is simple and effective. Here’s how it works: The Sun’s rays are reflected upward by mirrors to downward facing photovoltaic (PV) panels that generate electricity. To maximize efficiency the whole system pivots to keep aligned with the angle of the Sun as it arcs through the sky during the course of the day. One challenge with PV is that it’s only 15% efficient, meaning 85% of Sun’s energy is wasted, mostly in the form of heat. The Cogenra team found a way to harness that inefficiency by turning that solar electricity into hot water. The photovoltaic panels are attached to a metal plate with holes bored through it. Cold ground water at 60 degrees Fahrenheit is passed through the holes and that excess heat warms that cold water from 60 degrees up to around 140 degrees. We then use that hot water to supply our boiler, which heats it to our preferred temperature of 160. What’s exciting for us is the energy conservation that comes from the system heating the water. Previously we had to heat water from 60 degrees to 160, a 100 degree difference; with the cogeneration system in place we only need to heat it from 140 to 160, a 20 degree difference. This is important because we’re able to conserve on energy and burn less fuel in order to bring the water up to the proper temperature. Reducing the amount of fuel we burn to heat hot water is very important to us. We’re essentially bottling a food produce and santization requires a lot of hot water. We like the results so much that we’ve partnered with Cogenra to install two additional cogeneration systems, one at our Alexander Valley winery in Sonoma and the other at our winery in Monterey. With the new systems installed we’ll be the largest user of solar cogeneration in the United States. This project is just one of the sustainable energy initiatives that are happening at Kendall-Jackson over the past several years. Part of our commitment to being a green company means we’re always looking for new and different ways to make a positive impact. Since 2008 we’ve been buying renewable energy certificates (REC) for some of our operations. Then in 2011 we bought RECs equal to 130% of our annual usage — including buying it on behalf of our 1,000 employees’ home usage – a first for any company. When you add up the energy savings and renewable energy totals we’re conserving an amount equal to almost 6,300 homes annual usage or green house gas emissions from over 3 million gallons of gasoline – that’s equal to 27,000 tons of CO2. We’re now #32 in the U.S.among all organizations buying at least 100% renewable energy and were one of just 19 organizations who received an EPA Green Power Leadership Award in 2011.